In a village of Changyacha Pada( approximately 100 km from Mumbai), a little girl of age 3 and half years was playing in a lap of grandfather. She was enjoying a day and her grandpa was singing the lullaby, both unaware of destiny. Her mother, Nutan who is the housewife and me, Nitin her father working as a primary teacher in the school were enjoying bonding between my father and daughter. It was a lovely sight. Suddenly, Ishwari started vomiting containing blood and it hit us like a storm. We did not know what to do and were scared. I and my wife were freeze for the moment and could not move at all. It was a horrible situation. However, we managed to get into our senses and started moving. We took her to the nearest hospital and it took us one hour to reach there. There is no other hospital nearby. 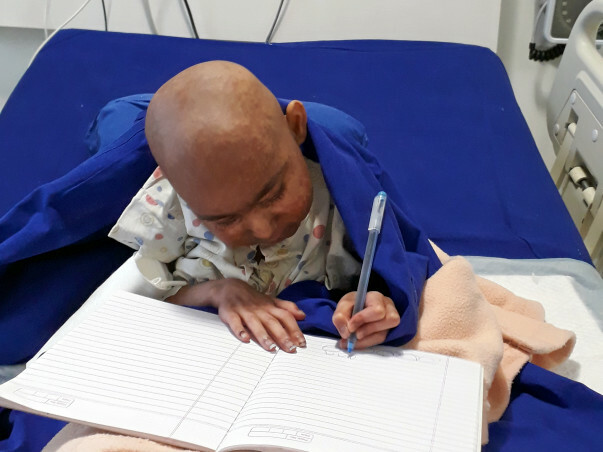 After primary stabilization, Ishwari was referred to bigger hospital for further diagnosis as doctors in this hospital found it difficult to diagnose the condition and wanted to give their best treatment. 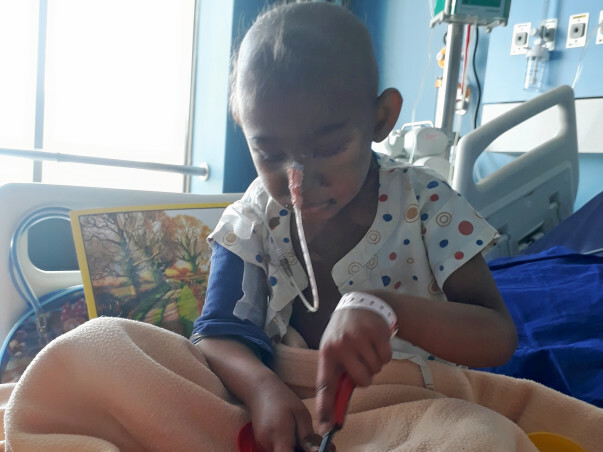 We took her to Wadia Hospital in Mumbai, the only affordable paediatric hospital for the children like Ishwari hailing from poor families like us. Doctors at Wadia hospital told us that it was not vomiting of blood and blood was coming from her gums. We were relieved at this confirmation but destiny had something else stored for us. Doctors were concerned and they alarmed us. They asked us few questions and carried out some blood tests. Me or my wife did not understand any reports and doctors told us that “your daughter is suffering from very rare autoimmune disorder”. Doctors were worried and we did not know what to do further. He showed empathy and explained further steps to us. They advised us to take Ishwari to further larger hospital for best treatment. They told us that she requires bone marrow transplant and stem cell therapy as a treatment and keep her alive. Doctors told us that in her disease body fails to develop enough blood cells. It makes her weak and she will bleed at the point of time if her platelet counts fall below a normal level. 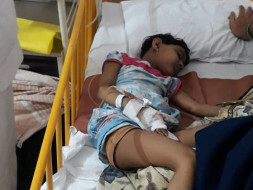 She needs the blood transfusion which is a temporary treatment to keep her alive. She has to undergo bone marrow transplant. It will cost us Rs. 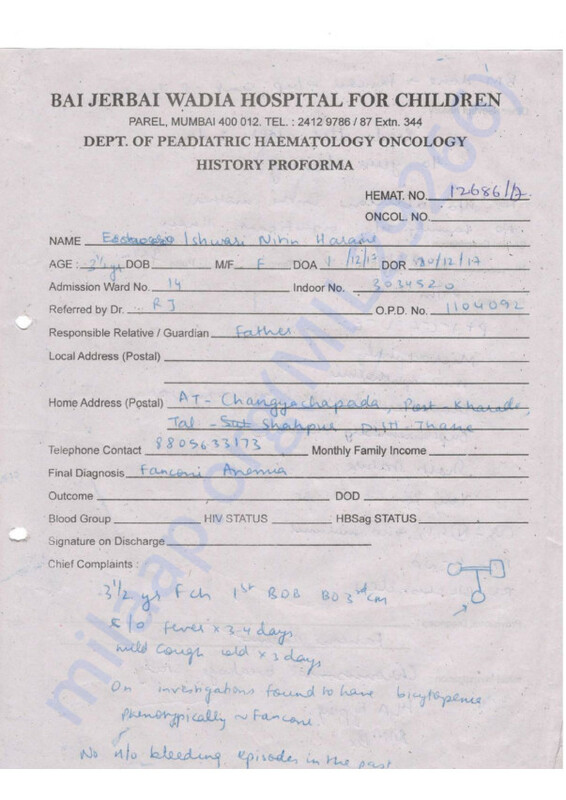 20 Lakh including bone marrow transplant and hospital charges. We even have to take care of other infections as well, as her immunity is weak. I am the simple primary school teacher and I teach kids of farmers from the nearby villages and my wife is a home maker. Ishwari is our only kid. She has every right to live a happy life and as her father, I wish to give her best possible treatment. Unfortunately, given conditions, we are really helpless to face such a big financial burden. I need your help to keep my girl alive and see her playing again. 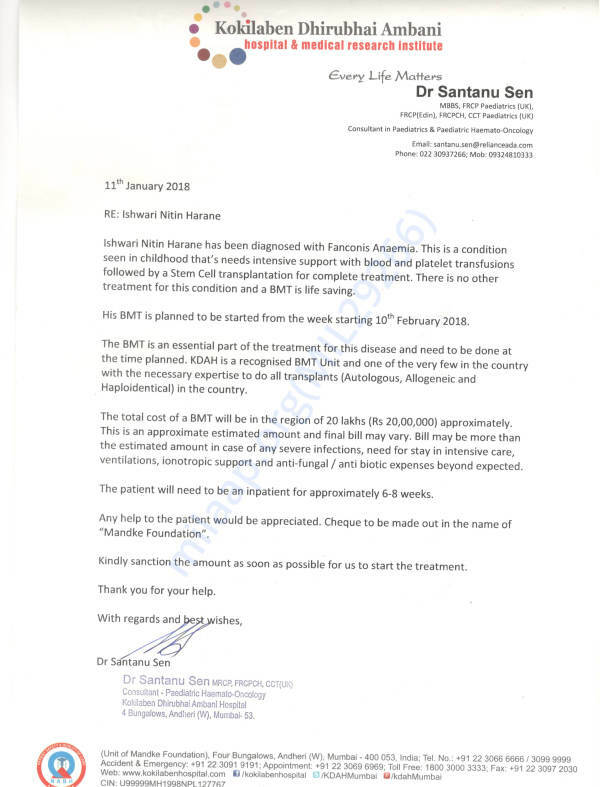 I request you to help us to get her bone marrow transplant done. As per doctor’s advice, it should be done as soon as possible and 10th February 2018 is the last date given by them. I have applied for personal loan and sold our gold and used our savings too but I have very less time to arrange for this large amount and this is beyond our capacity. Please help me to save my girl and bring happiness to her life. Thank you for your support. I could get my daughter treated because of you. Ishwari is doing fine now. She had some infections. However is recovering from it with the doctors support as well. Thank you once again for the support and please continue to pray for her health and recovery. We apologize for the delayed update. 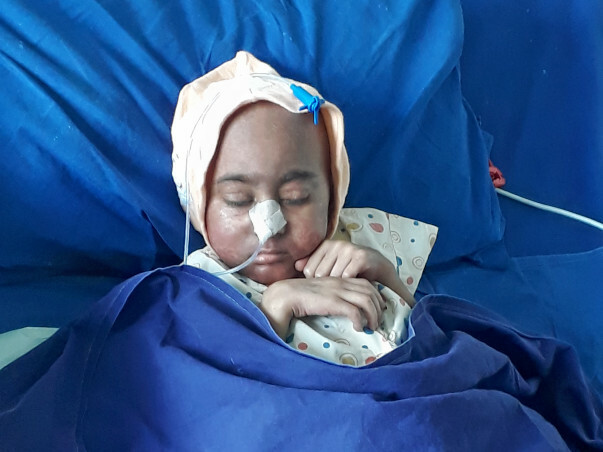 Ishwari underwent a successful transplant surgery on 24th February. 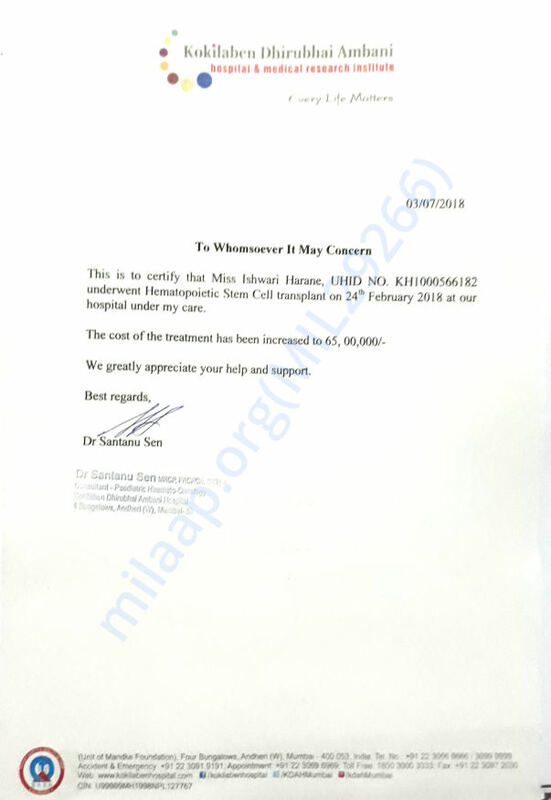 Me and my wife were the donors, Ishwari got an infection after the surgery but the doctors gave their best and she recovered from it. She was admitted in the ICU during last 5 days because her blood pressure got extremely low, her WBCs and platelet count were also unstable but as of now, she is stable and the doctors will closely monitor her to check if there are any symptoms of rejection. If everything went well, doctors have suggested that she will be discharged in the coming 4-5 days. This couldn't have been possible without you all. We are really thankful to the tremendous support and love you have shown towards her like she was your own child.